Программа предлагает простоту использования, с новыми функциями и большим количеством профессионально разработанных шаблонов, позволяющих создавать прекрасные цифровые альбомы за короткое время. 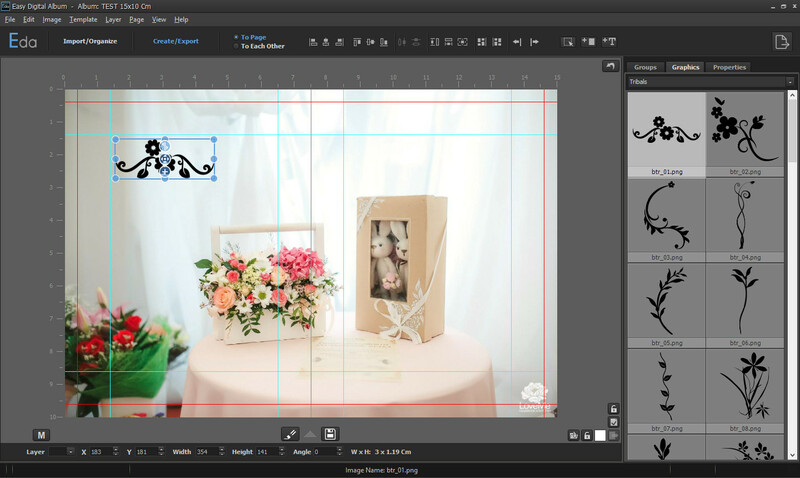 In Easy Digital Album you can create any album size you want (up to 100x50cm) choosing from any of the preset sizes or by simple typing your preferred size in the Width & Height fields. However, choosing a size doesn’t mean that you have to stick with it. For any reason you decide to change the size of an album EDA gives you the flexibility to do so, and not just changing the size of the album but also the aspect ratio of it while your layout remains unaffected! Whether you Import just a hundred of images or two thousand images EDA can easily handle it and with its smart image management system you will be working extremely fast once your images are imported. You can also Organize the images in Groups in the software and make it easier to find the shots you are looking for. 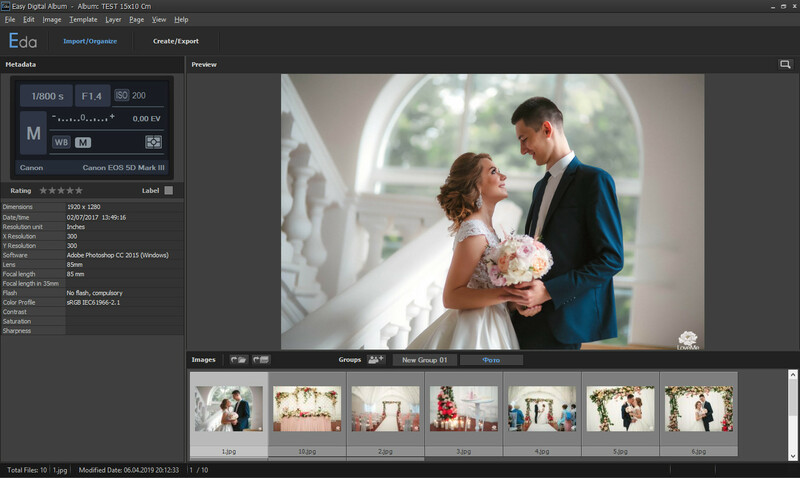 And if you prefer to shoot in raw and use Lightroom, Capture One, Bridge or any other software to edit, select and rate the images for the album before exporting them you will be glad to know that EDA recognizes the Color Labels and Ratings you have added to your images in any external application and let you filter them with these tags. Even if you haven't done so in any external app, EDA still gives you the option to apply Color Labels to your images in the software and filter them accordingly. You will be covered any way you prefer to work and you’re going to love the ease and the speed of the proccess. If you believe that designing an album is a time consuming process then EDA is about to change your belief. With many amazing features and the automated functions, that has evolved even more, in version 3.5 you’ll be able to create elegant digital albums in almost no time! Drag the images you want on a page and a layout will be created automatically! Press the arrow keys on the keyboard and new layouts will be created every time you press the key, based on proffesionally designed templates. Add properties like Stroke & Shadow and they will be applied automatically to your layouts. Decorate your pages by selecting from a variety of Backgrounds, modify the Opacity of Images and assign many properties to them like Stroke, Shadow, Masks, Gradients, Overlays, Vignettes and Borders... and not just to a single layer at a time but to all the selected layers at the same time. When you finish the creation of the album and it’s time to export your pages in high resolution files EDA offers you an extra benefit. You can export your pages not just in any of the most common file types, JPG, TIFF, PDF, but also in native PSD files, with all layers and styles included. This is one of the most powerful features of EDA that separates it from the crowd. It supports not just Opacity and Stroke but Shadow, Masks, Gradients, Overlays an even Text. And all this settings remain editable in the PSD files you export. EDA supports both Ratings & Color Labels you have applied to your images in any external application and let you filter your images accordingly. But in the case you haven't done so you still have the option to apply Color Labels in EDA! Create an exact duplicate of an album, with all the images you have imported and pages you have created, so you can easily make parent albums of smaller size and different layouts when it's needed. The new Copy - Paste Layers function allows you to copy, layers, like images, static items and text, with all their properties from one page to another on the exact same location. 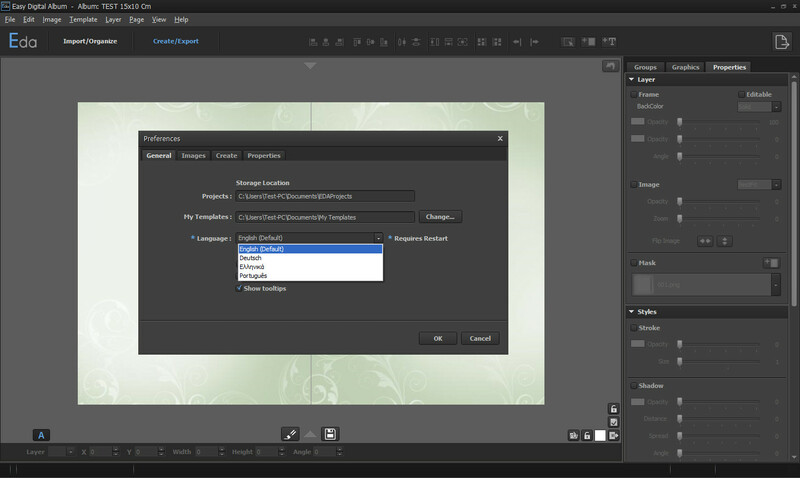 Before you Export the pages of an album as PSD files you have the option to add the Names of the Images on each image. So when you are sending the pages for approval to your clients it's easier for you if they wish to make some changes on the pages. Use the many keyboard shortcuts of EDA to easily Flip the Template Horizontally and Vertically or just Flip the Right or Left page separately, and you'll instantly have a different layout.